It’s no secret that Eastern Washington can get windy. Very windy, at times. And that’s not a problem… until that wind picks up loose soil and sends it aloft. Then you’ve got a dust storm, and that can lead to some real health concerns. Dust contains tiny particles that can lodge deep in people’s lungs. Much of this dust is truly minuscule – the particulates known as PM10 are about one-seventh the diameter of a human hair. The Wallula Maintenance Area (in green) in relation to the Horse Heaven Hills. In Eastern Washington, agriculture is the main source of dust. Farmers have made great strides in the last few decades in reducing dust, but there is still a need for improvement. That’s why Ecology created a High Wind Fugitive Dust Mitigation Plan for the Tri-Cities area. Part of the plan is to work with partners to encourage farmers to adopt additional voluntary practices that disturb the soil less and reduce the number of these high wind dust events. Most dust storms hitting the Tri-Cities start out in farmlands southwest of Kennewick. The Horse Heaven Hills are home to many dryland wheat farms and the area is the main source of dust for these high wind events. Several times in recent years, high winds have whipped up major dust storms in the area, and Ecology’s air quality monitor in Kennewick picked up PM10 readings that exceeded federal standards. For example, on Aug. 14, 2015, wind speeds hit a maximum of 56 miles per hour and our monitor recorded a 24-hour average reading of 589 micrograms per cubic meter – far above the 150 microgram per cubic meter 24-hour standard. 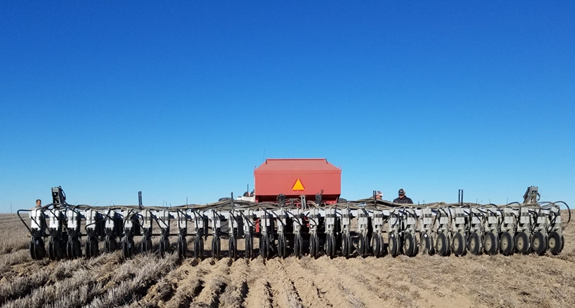 A prototype deep-furrow conservation drill helps to prevent soil erosion. We’ve drafted a plan and will put together a High Wind Dust Prevention Work Group with Ecology, Benton County Clean Air Agency, conservation districts, USDA offices and other partners. This work group help to educate farmers and the general public about the need to minimize dust during high wind events, promote conservation measures to minimize soil erosion and explore other steps to reduce soil erosion. We’ll work to better notify the public about high wind dust events, and work with the Washington State Department of Health to improve public education on the health threats from dust. Ecology is also investing $163,000 with the Benton Conservation District to incentivize farmers to use no-till or erosion mitigation methods on their fields. The backstory is somewhat complicated. 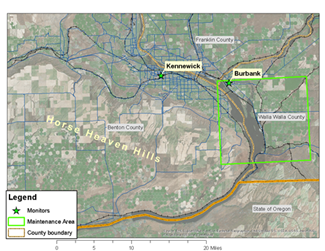 Creating the plan is a federal requirement stemming from long-ago air quality problems in the Wallula Maintenance Area – a region around the town of Burbank where, back in the 1980s, dust control issues led to a federal “non-attainment” designation for PM10. Although dust control in the Wallula area is now much-improved, there are ongoing federal requirements to prevent air quality from backsliding. Since the Kennewick monitor stands in for the Wallula Maintenance Area, high readings there triggered the need for a plan. The important thing is that the regulatory requirements that led to the new plan will bring us together with our partners to take further steps to better control the dust. And that should be better for everyone in the region. Before we get to work, however, we’re asking the public to weigh in on the High Wind Fugitive Dust Mitigation Plan between Nov. 5 and Dec. 12. Find the plan on our Outdoor Dust Management page. For more information, contact Laurie Hulse-Moyer, laurie.hulse-moyer@ecy.wa.gov.